Fig. 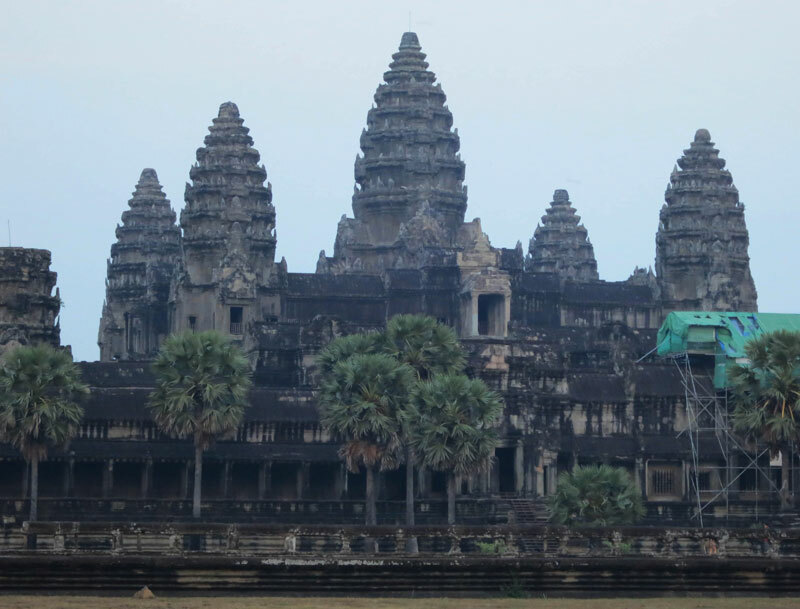 1: Angkor Wat temple’s design recreates three-staged cosmological journey. The Khmer temple was designed as a microcosm of the Hindu cosmological universe. In making his way from the temple’s entrance to the sanctuary at its center, the visitor undergoes a symbolic three-staged journey to salvation through enlightenment. The outermost boundary of a Khmer temple was often surrounded by a moat, a body of water symbolic of the Cosmic Sea (blue highlights in Fig. 1). For Hindus, the Cosmic Sea is the source of creative energy and life, the starting point for the journey toward salvation. The temple visitor begins his journey by crossing the sea on causeways lined with serpents, beasts similarly intimately associated with both Hindu and Khmer myths of creation (we explore the serpent in detail in our guidebook to Angkor). Continuing on his way to the center of the temple, the visitor passes through a series of massive enclosure walls; these walls recreate sacred mountain ranges, symbolic of obstacles that must be overcome on the path to enlightenment (green highlights in Fig. 1). Monumental tower gateways, called gopurams, grant the visitor passage through the walls, each successive one revealing a more sacred area, farther removed from the outside world. The combination of concentric enclosure walls with large gateways was derived directly from South Indian Hindu architectural precedent. Enclosure walls make their first appearance very early in the Khmer building tradition — at the late 9th century pre-Angkor site of Roluos in the temples of Preah Ko, Bakong, and Lolei — and are a constant feature in all subsequent temples. Fig. 2: Angkor Wat’s five towers. At the center of the temple stand sanctuaries with tower superstructures (red highlights in Fig. 1). The mountain residence of the gods. Under Hindu cosmology, the gods have always been associated with mountains. The sanctuary’s form, dominated by its large tower, recreates the appearance of the gods’ mountaintop residence, Mount Meru (Fig. 2). The mountaintop residence of the gods carried particular symbolic resonance for the Khmer people. God’s cave. The sanctuary proper, located directly under the tower, is where an image of the deity resides. Its dark interior is designed to represent the cave into which god descends from his mountain home and becomes accessible to human beings. The sacred intersection. 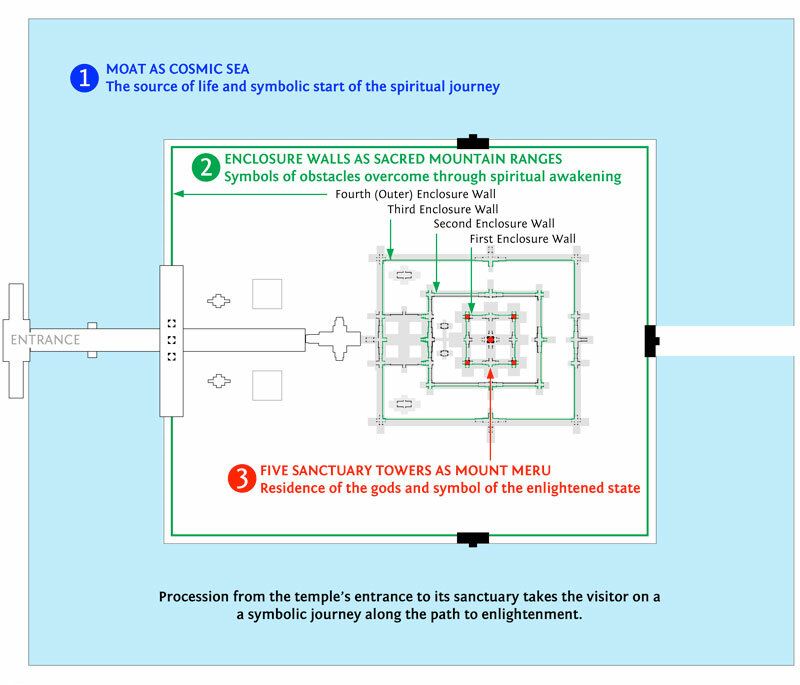 At the Hindu temple’s sanctuary, the worlds of the divine and living connect: the god’s vertical axis (mountaintop to cave) intersects with the visitor’s horizontal axis (temple entrance to cave). 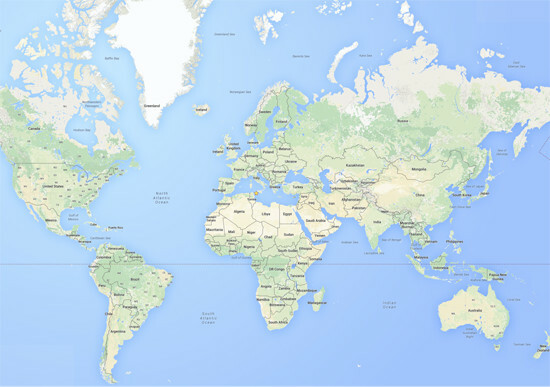 The entire universe emanates from this intersection, as unity with god is the goal of earthly existence. In Hinduism, god is believed to temporarily physically inhabit his representation in the sanctuary; the Hindu temple is arranged to enable the direct devotee-to-deity interaction that necessarily follows. Unlike other faiths, there is no religious intermediary and no abstraction; god is manifest before the devotee’s eyes, a profound encounter. It is here, among the peaks of Mount Meru, that the visitor’s symbolic journey ends in nirvana: the pairs of opposites characteristic of worldly existence (e.g., good versus bad, right versus wrong) fuse into a single infinite everythingness beyond space and time.